I'm a PDA user since 1997. 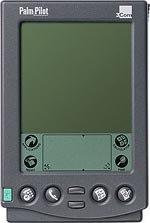 My first PDA was a Palm Pilot Professional which I later upgraded to a PalmIII. Over the years I've written quite a lot of software for all my PalmOS devices (TRGpro, PalmV, PalmIIIc, Sony Clie PEG300, HandEra 330). Around 2000 I've started to play with the new Java (J2ME / MIDP) phones that came up. I have written some small games for the J2ME phones made by Siemens (yes! you have read this correctly - you need to write Java applications for a specific group of devices because there is nothing like platform independent software, at least not on mobile phones). My current phone is a Nokia 7650 which is Symbian (Series 60) based. I've not done any software development for it yet (don't like the SDK very much) but I'm heavily using the device day by day. My latest device currently is a PalmOne Tungsten T3 which is quite nice but lacks multiple features. Why am I writing this? Recently I decided that I want a PDAsmartPHONE combination so that I only need to carry around one device. For this reason I have started to search for a good device which would fit my current needs ... your guess is right I didn't find it! As I want a really heavy iron (a device which can do everything) I've mainly looked at the manufacturers flag ships like the SonyEricsson P900 / P800 which by the way totally falls thru my list of requirements. The only plus points these phones get is for the form-factor (smaller then most other devices with this kind of feature list) and for not running PocketPC. The really bad points are the lack of implemented standards (like Sony MemoryStick instead of SD/MMC). But lets go over to the Nokia Communicator. The Communicator is big, heavy, has a keyboard and has much to many movable parts (it needs to be flapped open to be used). Also this device is running Symbian (now completely controlled by Nokia). It's hard to write bad things about the Communicator 9500 because it nearly has every feature (like Bluetooth, wireless lan 802.11, tri-band GSM, color display, a camera - I don't think a camera is needed but anyway). The only really bad part is the all ready mentioned form-factor and the fact that I don't like Symbian. The Treo600 is on the lower-end of the smart phones when it comes to features. It only has a small (160x160) color display, a SD/MMC slot and IrDA no Bluetooth or 802.11. But I really like the PalmOS (more then Symbian) with the wide range of available applications and a decent development support. Also it is a MP3 player - which is nice but not really needed. 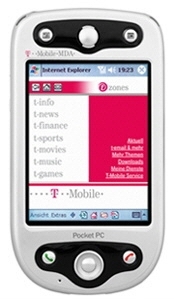 Lets go to the bad guys, the PocketPC smartphones. The MDA/XDA (I and II) is really nice when it comes to hardware (only lacks 802.11 wavelan) and form-factor (looks really nice and is metal) but the PocketPC OS is an absolutely No-No. Now that we have looked at the phones we go over to the PDAs. 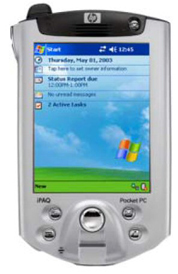 As we are currently looking at the PocketPC based devices we start right away with the Compaq/HP iPAQ. The iPAQ also has nice hardware (with the sledge you even get PCMCIA) but it is quite big and heavy compared to other PDAs (like the Tungsten T3). The iPAQs are around for some time now (one member of the old league like Palm and Psion) and therefore there is a Linux-port available for some of the iPAQs. This Linux-port really makes the iPAQ a good device. The Tungsten T3, my current device. 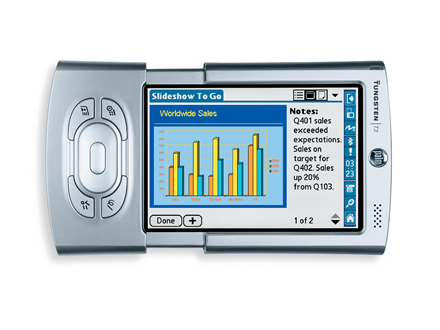 The T3 is, when it comes to PalmOS, the high-end device you want to have beside some of the Sony Clies. It has IrDA, Bluetooth and SD/MMC slot a 480x320 (rotate-able - which is very nice) color display, but lacks wavelan. Also it has this annoying slider which really takes out the stability of the device also it tends to get loose if you use it often (every day). Anyway the Palm form-factor really kicks in. The Sony Clies mostly have more features then the PalmOne devices which makes them look better (first!). But Sony thinks it can make there own standards like the MemoryStick. These Sony standards really make the difference for me, as I don't want them. Also they have this special PalmOS versions which are a little different - again these little differences don't work (for me!). Once, I had a Clie. Not to forget one of the older PDA makers Psion their OS is the base for Symbian. They still have a big PDA the Teklogix NETBOOK PRO. 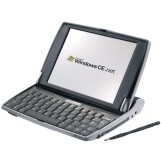 It looks more like a notebook then a PDA but it runs WindowsCE .NET, it has many features but it's defnetly not a PDA - more a sub-notebook (it's just listed here to have a Psion device here). Finally there is the Zaurus 5600 series of Linux PDAs. The hardware is ok, good standard processor. But no features like Bluetooth or wavelan. The device looks very cheap (sorry for this!) and the mini-keyboard with slider is the perfect anti-combination I can think of. I'm really sad to say all these bad things about the PDA that runs my favorite OS but these are facts (for me!). The new Zaurus SL-6000 looks a lot better (when it comes to features) but still the optical impression is bad. The perfect PDAsmartPHONE combination would be the size and shape of the MDA/XDA II with NO moving parts (except for buttons, slot and pen holder). The whole thing should be made out of metal (no plastic please). Minimal pen based user interface like a on/off button, phone pickup, and a small five-way navigator (like the Tungsten T3 has one), no keyboard please! One standard type of expansion slot and a standard cable connector. Stereo Audio playback and recording (non-stereo off course). Some decent amount of LEDs for optical paging/notification. Also the device should be build in a way that makes it possible to operate (hold) it in a rotated (horizontally) way, this includes access to buttons, slots and connectors. Also the power input should be separated from the data connector. The one big trick is Bluetooth and the USB-Host-Adapter. With the USB-Host you can plug in any kind of standard addon hardware, like a full sized keyboard (when you sit in the train or airplane), a big external hard-disk with all your MP3s, a GPS for car navigation or even a USB-network adapter if you need it. 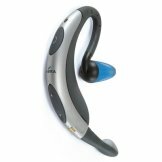 Thru Bluetooth you replace the need for a cable based headset, you can even use a wireless keyboard. Missing some hardware? No! Some stuff is not needed anymore like: IrDA (it's legacy! ), a camera - come on all the camera phones are so bad quality - they only come as a quick snapshot tacker. Also camera phones are being banned (for good reasons) from some places (your IT workplace?!) and I want to take my PDAsmartPHONE anywhere! A keyboard - I've mentioned this a lot, the fact is small keyboards don't help you? Do you like typing SMS on your phone? Nope! 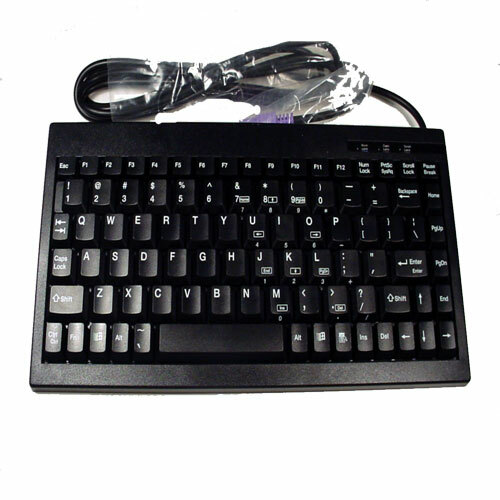 USB and Bluetooth keyboards are available go for these. Now to software. 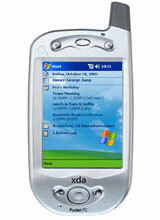 The software BTW a open operating system is the key feature for success of a PDAsmartPHONE. With open I don't mean open source! I just mean that there should be a good low-level API for third party software developers (Palm once did a good job here - sadly not anymore). The basic shipment of my PDAsmartPHONE should only contain the absolutely minimal requirements (as Palm once did). These requirements clearly are the minimal PIM (Personal Information Management) applications plus the stuff like a email web client. Everything else is addon! Security! A mobile device needs to be secure, loosing it is just to easy. Security also means confidentially - some PDAs still come without cryptography support (e.g. email web client without SSL). Security is NO addon - it's a basic functionality. It must be integrated into the whole concept. Company's require this (sometimes by law)! A good idea would be to use Linux for the OS. Just put all (secret - hardware access) low-level functions into well documented (binary) librarys. Rather do this then develop software that somebody else could write. Nobody will buy your device just because you have the best build in MP3 player but everything else doesn't work nicely. One company builds the hardware and everybody else writes the software (this is called specialization - it really works!). What I want is: have all my data together (don't want to synchronize my computer<->phone, computer<->pda and pda<->phone). I want to be able to speak on the phone via a Bluetooth headset over GSM/3G while surfing the web over IEEE 802.11 wavelan with the same device at the same time. Do VoIP over wavelan using by Bluetooth headset with the PDAsmartPHONE clipped to my belt. I want to type long texts (with my USB-keyboard) while riding the train, while listening to MP3 music from my portable hard disk (which takes power from the train). I want to read my email at a public hotspot without being afraid that somebody grabs my data (personally I'm not afraid of this). When going on vacation I want to be guided by my PDAsmartPHONE which gets traffic reports pushed down to me as I drive (automatically updating my route). I want to be all ways on-line (if I want to) to be reachable thru the internet. I want to directly exchange data with the other person I'm talking on the phone. Finally I want to be able to switch off everything I don't want at a certain time! HP announced/leaked some drafts on the new iPAQ h6300 (or what ever the name will be). According to MTekk the draft specifications show a device with features like: GSM (quad band! 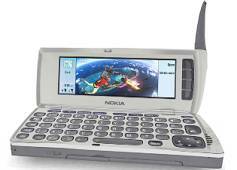 ), WLAN 802.11b, Bluetooth, IRDA, 640x480 display, 64MB RAM, 64MB Flash and USB. I think this is a really great device and I hope HP will bring this to market. I will defnetly try to get one. Only one thing to do, get Linux on the device and get everything working (specially the GSM functionality).